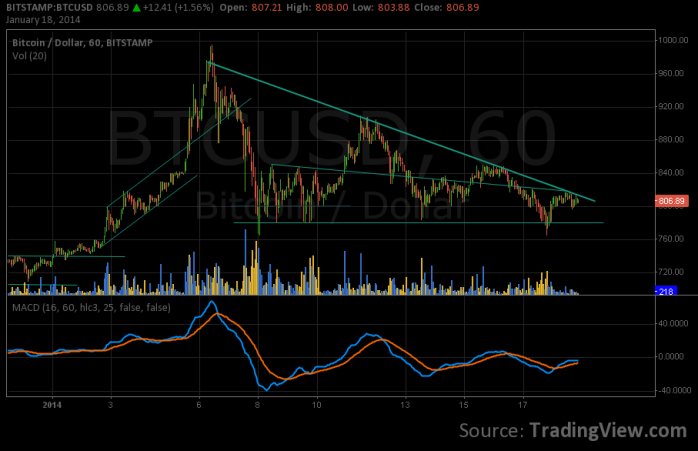 The Bitcoin market has been rather subdued of late, with decreasing volume and prolonged range-bound trading. One of the highlights of this week is the definitive emergence of Bitstamp as the exchange with the second biggest trading volume, replacing MtGox in this position. The highest volume is traded in the Chinese exchange Huobi, as it has no trading fees. Bitstamp has been used as the exchange of choice for this analysis. The continuous lower highs over the past two weeks still indicate a bearish trend. On the lower side we have been bound by supports at $780 and $765, as shown in the chart. It seems tempting to call this current pattern a descending triangle, but those are strictly continuation patterns and do not form at reversals. The conclusion is still quite the same though — the descending upper bound of our range-bound movement indicates a bearish sentiment, a continuous decrease in demand for Bitcoin at the higher price ranges. Our range-bound movement is hence very likely to break out downwards. Given the size of our “triangle”, the price is estimated to fall atleast to $710 and atmost to $580, before stabilising. Of these outcomes, a fall to $710 is more likely, as there is currently no major negative market-moving news to justify a fall that far down. Barring other news, any further major movement would be after the long awaited January 31st Chinese deadline, or on release of new information regarding the same.